You can't get much more British than a prawn cocktail! This 1970s favourite is a real classic and is just as tasty today as it was 40 years ago. Thank you to www.makemoreofsalad.com for allowing us to share this recipe. Worcestershire and Tabasco sauces then stir in the prawns. Spoon the prawn mixture into the serving dishes and top with the remaining lettuce. Finish with a sprinkle with smoked paprika. Serve immediately. 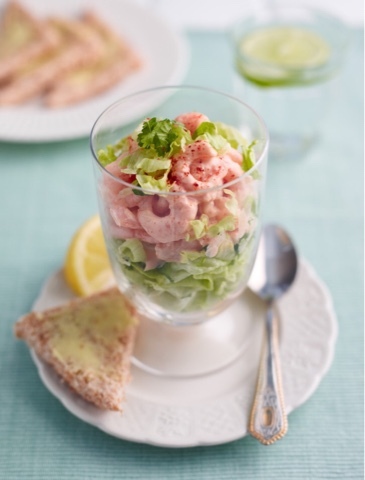 Try replacing the iceberg with shredded round lettuce and use tiger prawns with a little harissa paste for extra spice. Serve in 4 wine glasses for the classic 1970’s starter.